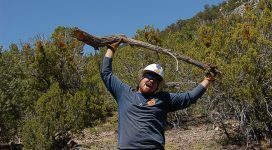 During the spring and summer of 2016, crews 6 and 7 based at our Middle Rio Grande office have done extensive work in the Gila National Forest in partnership with the United States Forest Service and in coordination with the Silver City Ranger District. Both crews were present for trail clearing and tread rehabilitation on the Black Range Crest Trail No. 79. The major task for this project was to re-establish and clearly distinguish the trail corridor. This segment was badly damaged by intense wildfire in 2013 and was indiscernible in many spots. With their work to brush-out and clear downed logs, the trail is once again safe and accessible for users. Crews have established re-routes along the trail, constructed retaining walls, and created a safe ford across a deep and tricky gulch as well as repaired fire-damaged trail in the segment north of Sawyer Peak. 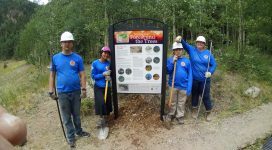 During their projects, the crews successfully rehabilitated 7 miles of trail from Emory Pass to the southern trailhead on Royal John Mine road. In addition to this work on the BRCT, the crews also made improvements on the Signal Peak Tr. No. 742 and a 3.5 mile segment of the Continental Divide National Scenic Trail at the end of June.The work completed on the 3.5 miles of the CDNST brings the Silver district one step closer to opening a segment of trail that has been closed since May 2014.It was a pleasure for our crews to continue to restore and make accessible one of the most beautiful areas in the United States. The crews did a fantastic job this season.